What put C60 on the map was this 2012 rat study in France led by Fathi Moussa. The scientists split the rats into 2 groups (the control group and the test group) and gave the latter C60 absorbed in olive oil. C60 is not water-soluble but it is fat-soluble, so they surmised that olive oil would be a good delivery system. The actual intent of the study was to find out the lethal dose of C60, but the results shocked the researchers. They discovered that the lifespan of the test group rodents was extended by 90%! This is basically double. It may even have been longer, too, but the scientists had to kill the rats to end the study. They also discovered that the test group did not develop tumors while the control group did. C60 is derived from charcoal, a form of carbon. So how does C60 disable damaging free radicals? In plain English, here’s how: C60 accumulates in the inner membrane layer of mitochondria, which is deep inside the cell. C60 has electrical properties; it absorbs protons, which changes the electrical potential across the entire membrane structure. This in turn greatly decreases the formation of superoxides and other ROS. The end result is a reduction in oxidative stress. [C60] is a very lipophilic molecule and it goes in some places in the organism that other natural antioxidants don’t go. It can access cellular structure[s] or subcellular [structures] that the other antioxidant[s] cannot access. Free radicals are molecules that have one or more electrons too few or too many, and they will damage any biological molecule they come in contact with. 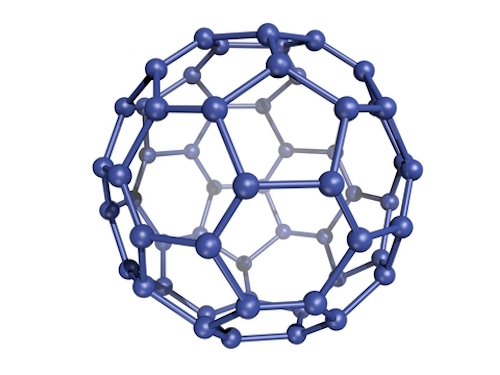 The Buckminsterfullerene C60 molecule can accept several electrons in case of a free radical with an electron surplus, and donate several electrons in case of a free radical with an electron deficit. C60 thus is an incredibly effective antioxidant, not in the least because it does not get degraded or unstable by accepting or donating electrons … The unique aspect of C60 is that accepting an electron does not alter the structure of the C60 molecule, effectively infinitely recycling it. C60 can accept or donate many electrons (it works as an electron reservoir). Is This Why Only Organic Fruit and Veggies Stop Cancer?